As diversity in higher education becomes more of a focal point and a means to reflect on our own institutions and practices as academics, we will be re-posting material related to these issues on the first Thursday of every month. This post is borrowed from Conditionally Accepted. In physics, we have hierarchies: between particle physics and everyone else; between theorists and experimentalists. It’s a nasty business and business as usual. It’s not surprising, then, that there’s just one African-American (genderqueer) woman Ph.D. who does theoretical particle physics or its holistic cousin, cosmology — me. Black men are slightly more common, at a count of about five. None of us were expected to be here. I have two origin stories as a theoretical physicist. When I was 10, my mum took me to see Errol Morris’s documentary about Stephen Hawking, A Brief History of Time. Going in I didn’t want to be there, halfway through I wanted to solve problems that Einstein hadn’t, and by the end I had decided to become a theoretical physicist. Not long after, one of Hawking’s graduate students explained to me by email that doing so required: going to a first-class university, getting a first-class degree and entering a first-class Ph.D. program. I started planning. I was from the ghetto, but I was going to attend Harvard or Caltech. Nine years later, I was just months away from my graduation from Harvard College. I had chosen Harvard over Caltech because I didn’t want to be the only black woman in my graduating year. That decision was the first of many I would make because of my ascribed identity and how people made me feel about it. By the time I was nearing my Harvard graduation, I knew I was going to graduate school, but I had applied in astronomy and not physics and with the plan of doing exoplanet phenomenology, not theoretical cosmology and particles. Why? Harvard had taught me that physics departments were cruel places where girls from the ghetto didn’t belong. Scientists at the Center for Astrophysics were more welcoming. I had gotten the message early and often: people like me don’t become particle theorists. According to one person, people with grades like mine didn’t become theorists, and I had noticed that the people with grades unlike mine were so unlike me in fundamental ways. They had parents who were Ph.D.s, they came from upper-middle-class households, they went to schools that could afford to offer Advanced Placement BC calculus classes, whereas I taught the course to myself. When I looked at who was excelling in advanced courses that all theorists needed to take, they were almost all one of two things, and usually both: male and white. When I wrote to Hawking, I said nothing about being a little black and Jewish girl from the East Los Angeles neighborhood of El Sereno, but Harvard taught me that these ascribed identities set me apart, priming me to take my place on the “wrong” end of what Joseph Martin calls “prestige asymmetry.” So, when I wrote to prospective graduate advisers, I took a chance and mentioned my background, hoping someone wanted to help me succeed. One of them was Edmund Bertschinger, an esteemed theoretical astrophysicist at Massachusetts Institute of Technology. Professor Bertschinger wrote back and told me that a black mathematician and theoretical physicist was visiting MIT that year, and he encouraged me to email Professor Arlie Petters. I looked up Professor Petters and learned that he was, like my mom, a West Indian. My second origin story begins with meeting Professor Petters, the first black professor of theoretical physics I had ever met. Petters asked me if I was planning to take his graduate course in general relativity at MIT. I gasped before informing him that people like me don’t pass classes like that. Nonsense, he said. I would take his class, and whenever I had a question I would show up at his office. I gave up arguing, got my cross-registration form signed and began to commute to MIT. I was the only woman, the only undergrad and certainly the only black person in the class. But I thrived, eventually going into the final exam with the highest grade in the class. By the time Professor Petters insisted I attend the 2003 National Society of Black Physicists meeting with him, I was changing. I was into general relativity’s beautiful mathematical artifice and hungry for more. I still believed that this excitement could never be a foundation for a career, but I had also stopped thinking about it so much. At NSBP, room after room was full of black physics students, the majority from historically black colleges and universities, which were at the time the dominant producers of black bachelor’s degrees in physics. But equally importantly, there were black physics professors everywhere, including a few speakers in three sessions about cosmology and gravity. I went to all of those sessions, learning that, contrary to what I had been told, it was possible to make particle physics and cosmology accessible to undergraduates. A vision began to coalesce in my mind. Professor Lindesay eviscerated a stereotype that was holding me back: I thought quantum field theory was for white boys, not me. In that moment, because I so admired him, I believed him when he believed in me. I realized I could become a theoretical physicist. Today I am a theoretical physicist (or astrophysicist, depending on whom you ask). Because of the significant role it played in my life, NSBP has been my primary site of service to the physics community, as chair of the Cosmology and Gravity Committee for over 10 years and as co-chair of the 600-person conference in 2011. Doing this volunteer work helped keep me on the path during the many sexist and racist bumps I ran into on my path to becoming and existing as a theoretical astro/physicist. It also helped me see the powerful, ongoing importance of HBCUs like Professor Lindesay’s Howard University. HBCU physics departments are the foundation that any African-American physicist stands on. Even as they shrink in number today, they care for black students in ways that schools like Harvard do not. Spelman College remains the top producer of black women — nationally — who go on to Ph.D.s in STEM. It is HBCUs that have valued black physicists enough to hire us as faculty, holistically recognizing the significance of our existence as well as our research and service, rather than narrowly defining success via impact factor and publication rate. Black faculty, like black lives, matter. Black students don’t just attend HBCUs, and black students at predominantly white institutions deserve the kind of support that a professor like James Lindesay provides. Duke University students are lucky to have Professor Petters and two other black faculty members. But such groupings are incredibly rare — most physics departments have no black faculty, and no university in North America has a black woman professor of particle or cosmology theory. Faculty wishing to diversify academe regularly complain to me that particle/cosmology theorists act as gatekeepers during admissions and hiring, accepting only very high GRE scores and grade point averages, requiring more significant course preparation and refusing to budge on publication metrics, regardless of other contributions. Those faculty block people like me from ever getting admitted, much less hired. Even if I never become a professor, one day a black woman particle theorist will. And then another. What about two at the same time? Imagine the doors they will smash wide-open, changing the face of physics and what we know about the universe. 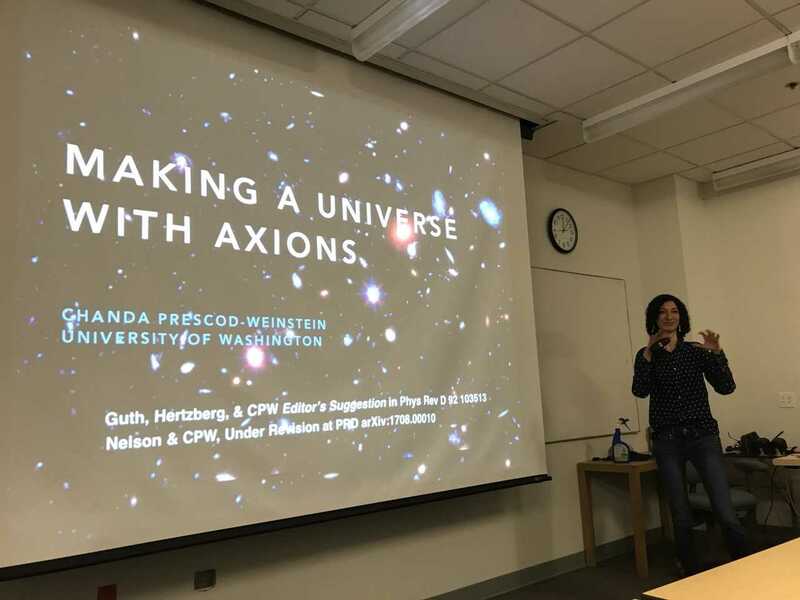 Chanda Prescod-Weinstein is a postdoctoral research associate in the department of physics at the University of Washington. Her research focuses on the intersection of cosmology and particle physics, with a specific focus on dark matter and the structure of space-time. She is also principal investigator on a grant to study the impact on science of excluding black and Native women from physics. This post originally appeared in Conditionally Accepted, a column of Inside Higher Ed, on March 9, 2018.